After reading the book “Jesus, Mary And The Charismatic Priest” by Val Wineyard I learned Rennes Le Chateau was a re-constructed as an expression of adoration of Mary Magdalene by Berenger Sauniere in the late 18th century. Even though there is an amazing display of art and often subtle symbology to Mary Magdalene it does not tell the deeper, energetic story. The church has a gentle heart-felt connection, a light blue color that is an etherical vibration, like the color of the dome in the church itself, permeating each individual who enters this special sanctuary. In preparation for my trip to Rennes Le Chateau from Austin, Texas, USA I astral communed with the Chateau and the sensation experienced was a nurturing, kind beyond most human energies and surrounded by a light blue color all within my heart as I concentrated on Rennes Le Chateau in meditation. When I entered the church two months later it was surprising and confirming to experience the same perceptions. Why is this so? Is this the energetic signature of Mary Magdalene? According to Val Wineyard, the site of the church before it was Catholic was a church of Isis and the Visigoths lived on the peak. Others say Mary was a Sister of Isis with roots in Egypt, before her time in Jerusalem. Maybe Rennes Le Chateau was a place she was a community leader or was later worshipped in her teachings. 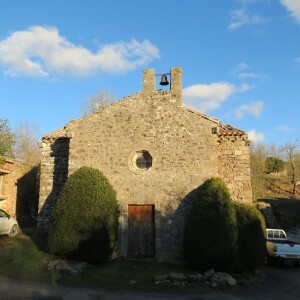 The heart-felt sensations of the “Mary Magdalene” presence permeate through-out many places besides Rennes Le Chateau and other sites such as The Church De Bugarach, The Fountain of Love, Hermitage De Galamus and others. Each location opens you, people generally feel more at peace and those more sensitive perceive their heart opening to a greater place of love or lighter vibration within. Some of these places legend say Mary was there such as she did baptisms at The Fountain Of Love while other sites energies were created through worship and prayer of Mary followers. Of course all of the sites are most likely aligned with lay lines whose source is Pic De Bugarach, as the people of those times knew the importance of building their places of worship on these high vibrational spots. Still today whether we visit the ruins of De Bezu or an active church like Rennes Le Chateau we feel the presence of something greater than us.